Tigerair's pan-Asian vision is in abeyance. 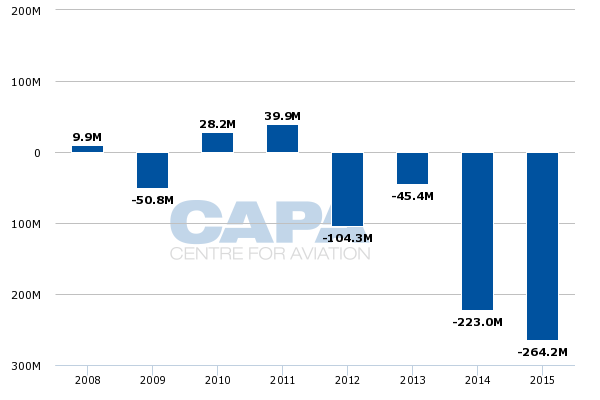 The Singapore-based LCC has reported more losses for the quarter and year ending 31-Mar-2015. The group has now been in the red for four consecutive years, accumulating losses of over USD500 million. But Tigerair’s outlook for the fiscal year starting 1-Apr-2015 (FY2016) is brighter as the group closed or sold its highly unprofitable overseas joint ventures in FY2015 and restructured its Singapore operation. The group also reduced the size of its fleet in FY2015 by subleasing aircraft and cancelling orders, a painful but necessary exercise. Tigerair is now planning to sell two more A320s in FY2016 as it reduces its operating fleet to only 23 aircraft. Tigerair Group’s current seat capacity in Singapore is down by about 16% compared to May-2014, with nearly all the reductions occurring on competitive routes as Tigerair has been launching new routes which are not served by other LCCs. Total LCC capacity in Singapore also has been reduced, enabling Tigerair and other carriers to boost load factors and yields. But Tigerair continues to warn of overcapacity and intense competition in the Singapore market, which could impact its ability to complete a turnaround and become profitable in FY2016. This is Part 1 of CAPA's analysis of the Singapore LCC sector. Singapore-listed Tiger Airways Holdings, also known as the Tigerair Group, reported on 5-May-2015 a net loss of SGD264 million (USD205 million) for the year ending 31-Mar-2015 (FY2015). This represents a 19% increase from the net loss of SGD223 million (USD177 million) for FY2014. The group has been unprofitable every year since FY2012. Tigerair has now accumulated an alarming SGD637 million (USD505 million) in losses over the last four years. The group, which completed an IPO in Jan-2010 (4QFY2010), was last profitable in FY2011. The dismal financial performance has forced Tigerair to pursue several rights issues in recent years, which has resulted in original part owner Singapore Airlines (SIA) gradually building up its stake as there was little interest from other shareholders or potential new investors. The SIA Group became a majority shareholder in Tigerair in late 2014 and currently has a 55.8% stake in the short-haul LCC. The losses over the last four years, including the record loss in FY2015, have been driven by the poor performance of Tigerair’s overseas affiliates. The group’s original Singapore operation has been profitable for slightly over half of the 21 quarters – and is in the black on a cumulative basis – since Tigerair became publicly traded in 4QFY2010. Tigerair Singapore was roughly break-even in 4QFY2015 and was also roughly break-even in 3QFY2015. But it was in the red for five consecutive quarters from 2QFY2014 through 2QFY2015 as Singapore’s short-haul market was plagued by overcapacity. As CAPA previously outlined, the sale and closure of Tigerair’s affiliates in Australia, Indonesia and Philippines should improve the group’s outlook over the medium to long term. Tigerair completed the sale of its remaining stake in Tigerair Australia to Virgin Australia in Feb-2015 and shut down its Indonesian affiliate, Tigerair Mandala, at the beginning of Jul-2014. It completed the sale of its stake in Tigerair Philippines to Cebu Pacific in Mar-2014. The group’s only current overseas investment is a rather insignificant 10% stake in Tigerair Taiwan, which launched operations in Sep-2014. As additional aircraft could not be absorbed in the Singapore market Tigerair had to ground several A320s in FY2015 while it tried to remarket the surplus aircraft. Eventually it forged a sublease agreement with IndiGo for 12 A320s, 10 of which were delivered to the Indian LCC in 2HFY2015 with the last two being delivered since the start of FY2016. But Tigerair incurred over SGD100 million (USD78 million) in one-time charges in FY2015 as these aircraft were subleased at a lower rate. Tigerair was also able to sublease or place three of its A320s in FY2015 at start-up Tigerair Taiwan. In addition the group cancelled the nine A320ceos which were originally slated to be delivered in FY2015 and FY2016. The cancellations were part of a deal with Airbus that was forged in Mar-2014 that included placing new orders for 37 A320neo aircraft plus 13 options. Even after cancelling or subleasing 24 A320s Tigerair continues to be saddled with excess aircraft. In announcing its 4QFY2015 results the group revealed that it plans to dispose of another two A320s in FY2016. The group incurred a one-time charge of SGD17.5 million (USD14 million) in 4QFY2015 to reflect the anticipated sale of these owned aircraft. The group also stated it plans to sublease one more A320 to Tigerair Taiwain, which is expected to take delivery of the aircraft by the end of Jun-2015. Tigerair Singapore currently operates 24 A320s and has two A319s which are grounded. The carrier plans to reactivate the A319s, which were previously operating at Tigerair Philippines, to replace the two A320s which have been earmarked for sale. As a result the total fleet in Singapore will be reduced to 23 aircraft (when also factoring in the additional sublease to Tigerair Taiwan), including 21 A320s and two smaller A319s. Deploying 23 aircraft in the relatively mature Singapore market is a more realistic scenario compared to the 27 aircraft Tigerair Singapore was operating at the beginning of FY2015, when its capacity levels were higher and outstripping demand. But the group still faces long-term fleet challenges as it is now committed to 39 A320neo aircraft for delivery from 2018. In addition to the 37 A320neos ordered in Mar-2014 the group recently decided to convert two A320neo options into firm orders as part of a deal with Airbus that enabled it to cancel the two A320ceo commitments that it inherited from Tigerair Australia. Tigerair Australia had four A320ceo aircraft on order but two of these orders were reassigned to the Tigerair Group in early 2015 as part of the sale of Tigerair’s remaining 40% stake in Tigerair Australia while Virgin Australia has taken over responsibility for the other two A320ceo orders. Tigerair could struggle to find markets for all 39 A320neos. Singapore has limited growth opportunities and is unlikely to support more than 25 – or at most 30 – aircraft. The group has limited alternatives for placing excess A320neos as it does not plan to re-establish a portfolio of overseas affiliates. Tigerair no longer has any stake in Tigerair Australia or Tigerair Philippines, both of which may be rebranded in FY2016. Tigerair Taiwan has said it plans to source its future aircraft outside Tigerair Group, which only has a 10% stake in Taiwanese carrier and therefore has limited influence on its fleet decisions. Placing excess A320neos at another SIA Group subsidiary is also not a possibility as SilkAir is now transitioning its fleet from A320s to 737s. New SIA-Tata Indian joint venture carrier Vistara operates A320s but has already committed to acquiring 20 A320s from BOC Aviation. Tigerair initially overcommitted to aircraft back in 2007, when it placed orders for 50 A320s. At the time the group was confident it would be able to establish and rapidly expand joint venture carriers throughout Asia. But the expansion was hindered when several times the group was forced to put more aircraft than initially anticipated in the Singapore market as new affiliates were slow to launch and subsequently struggled to gain traction. The fastest growth occurred in FY2014, when Tigerair Singapore grew ASKs by 26%. This followed 15% ASK growth in FY2013. Such rapid expansion would not have been pursued were it not for the challenges confronting the overseas affiliates, which forced the group to add capacity in the relatively mature Singapore market. Overcapacity in the Singapore-short-haul market inevitably resulted, leading to a steady decline in yields from 2HFY2013 through 1HFY2015. There was also a significant drop in load factor in FY2014. Tigerair Singapore began slowing expansion in early FY2015, followed soon thereafter by capacity cuts and a network restructuring. Tigerair Singapore monthly ASKs peaked at about 1.1 billion in late FY2014. Monthly capacity was still above 1 billion ASKs in the three months of FY2015 (Apr-2014 to Jun-2014) and for 1QFY2015 was still 15% above 1QFY2014 levels. But year over year capacity was roughly flat in 2QFY2015 before dropping below prior year levels for all six months in the second half of the fiscal year (Oct-2014 to Mar-2015). For the last month of FY2015, Mar-2015, ASKs were down 12.4% compared to Mar-2014. ASKs were down 10.7% for the fiscal fourth quarter and for the full fiscal year were down by 1.1%. Tigerair Singapore’s load factor for FY2015 improved by 4ppt to 82.1% but yield dropped by 2%. However, the carrier recorded yield improvements in 3QFY2015 and 4QFY2015, ending several consecutive quarters of declines. Yield improved by 12% in the most recent quarter, an indication that the capacity cuts and route restructuring implemented in 2HCY2014 have been bearing fruit. 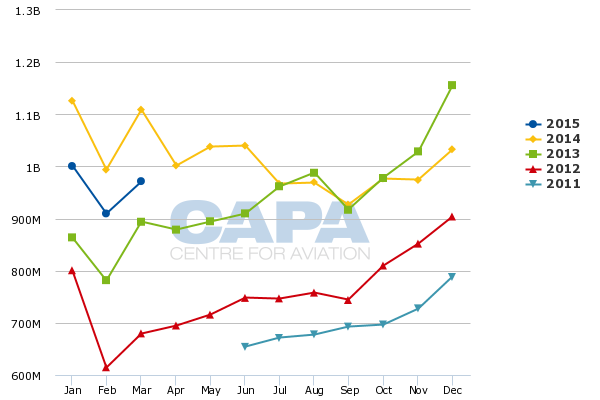 Total LCC capacity in Singapore is down 4% compared to May-2014 levels, according to CAPA and OAG data. As CAPA has previously highlighted, Singapore’s LCC penetration rate has declined since peaking at almost 34% in late 2013 and early 2014. LCCs currently account for about 30% of total seat capacity in Singapore. Tigerair has been the biggest driver of the reduction in Singapore’s LCC penetration rate but other LCCs serving Singapore have also responded to the challenging market conditions by cutting capacity or slowing down expansion. The second part in this series of reports will look in detail at where Tigerair has cut capacity as well as where it has added capacity. Part 2 will also analyse some of the adjustments made by the other main players in the Singapore LCC sector and how market shares have shifted over the last year. While overcapacity remains a concern on some routes, overall market conditions in Singapore have improved following the reductions in LCC capacity. Tigerair should be able to continue to boost its load factors and yields in FY2016. Tigerair should also benefit in FY2016 from lower costs as the hedges it committed to when oil prices were higher expire. Tigerair has hedges in place that cover 40% of its fuel for FY2016 and 1QFY2017 at an average price of USD94.42 per barrel. Tigerair Singapore should there be able to return to profitability in FY2016. The group should also be back in the black as all the overseas joint ventures have been sold or closed. But the profits will likely be modest and come at the expense of market share. Tigerair’s market share in Singapore dropped to 9% in 1QCY2015 (based on total passengers carried at Changi) and the group is unlikely to again capture a more than 10% share of its home market. This is an acceptable price to pay as Tigerair settles into its new less ambitious role within the SIA Group with a focus on profitability and feeding faster-growing long-haul sister carrier Scoot.